The market for small cars with large six-cylinder engines doesn’t really exist - so why, exactly, did Rover shoehorn a quad-cam V6 under the bonnet of a car that was, in basic terms, a rehashed 1994 Honda Civic? 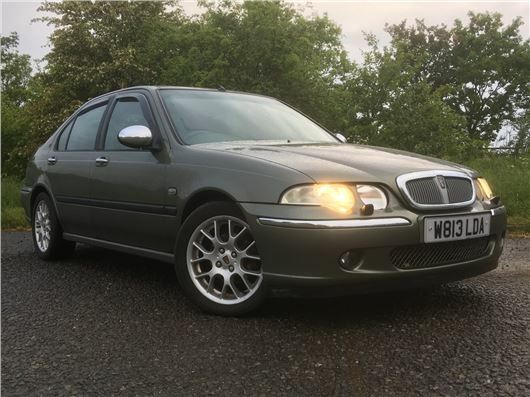 Given that it already had the 75 in production as a flagship and had a 2.0-litre engine previously in the 400, albeit a four-cylinder, there’s no rational reason whatsoever that the Rover 45 V6 should ever have existed. Nor, indeed, was there any particular reason to invest money into developing it - a move that required not only a complete redesign of the engine bay, but also a revised floorpan to accommodate the gearbox housing and a redesigned front bumper to allow for more airflow around the considerably larger engine block and - essentially - the gearbox oil cooler. The market opportunity was tiny, given that it was expensive to run, tax and insure, while the combination of auto-only transmission, two extra cylinders and a host of extra weight meant it was also considerably thirstier than the 420GSi that the model replaced. Introduced at the start of 2000, the 45 V6 was offered as a four-door saloon only, in both Club and Connoisseur variants of the 45, with the majority of the 400-or-so cars made being the luxury Connoisseur variant. If you were particularly posh, you could go even more upmarket and add some plush ‘Personal Line’ leather upholstery in either ‘Catkin Green’, ‘Copperbeech Red’ or the rather queasy ‘Neptune Blue’. Each of which came with carpets to match. These are the rarest variants, not least because you needed to add an extra £2,000 to the already hefty price tag in order to get there. The engine was Rover’s KV6, as fitted to the 2.0 75, and mated to a five-speed Jatco automatic transmission with Steptronic function - a transmission that was arguably less advanced than the Stepspeed CVT that was fitted to four-cylinder 45s and 25s but which, apparently, would have exploded if fed with the extra torque of the 150bhp V6. It’s a fine handling car, too. The weightier engine required stiffer front dampers, which serendipitously went on to become those used on the MG ZS - a car that was renowned for being one of the best-handling models of the 2000s. It’s not a traditional sports saloon, for the 45 V6 is more about smooth progress, but if you need it to be, it can be. But it was also a car full of juxtapositions. Some of the finest quality leather that money could buy, of the same grade as that found in a Range Rover Autobiography (on pre-2003 cars, at least), sat in the same cabin as a flaky plastic dashboard that could trace its roots right back to the Honda Civic on which the 45 was based. The same could be said of the paint and trim - deep lustrous metallic and subtle chrome brightwork, accompanied by door handles that frequently came off in your hands. Like a belligerent elderly relative, the 45 V6 was frustrating at times, but once you got to know it, it was really quite loveable. Like we said at the start - an utterly irrational car and one that probably should never have existed, glad as we are that it did. If Rover Group had been a bit more rational in its approach, then maybe the brand would still exist today, but Q-Cars like this one certainly wouldn’t.